Farmworker Reality Tours allow participants to meet, dialogue with, and hear the testimonials of farmworkers. 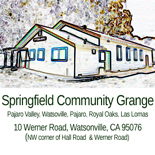 The date of the “Reality Tour” organized by the Springfield Grange at the Buena Vista Migrant Camp with Dr Ann Lopez has been changed to Sunday October 21, 2012. This event includes a traditional home cooked meal. We will be inviting members of other Granges in the area. Please join us for this valuable and eye-opening educational opportunity. In 2009, requests for Farmworker Reality Tours increased significantly from a variety of organizations. The San José Human Agenda organization has always sponsored a yearly FW Reality Tour. In 2009, De Anza College English class instructors, Marc Coronado and Karen Chow, brought several classes of students to the fields to learn about the lives of farmworkers. This entry was posted on July 17, 2012 by springfieldcommunitygrange in Announcements and tagged 2012, Conciousness-raising, Education, Farm Workers.